Did everybody have a good Christmas/Hanukkah/Kwanzaa? Mine was pretty wonderful! On Chrismukkah Eve, Erlend and I saw the new Star Wars movie at the fancypants brew-and-view in downtown Brooklyn. On Christmas Day, I attempted and failed to make a white chocolate and black tahini babka (but eventually succeeded, yay! ), before we trekked over to the Upper West Side with his parents, where we exchanged presents. I got this awesome cake box that I've been coveting for years now, a vintage cake stand, and at least a dozen Compartes chocolate bars in my stocking. I am feeling very fat and happy and seasonal and whatnot, but I guess it's time to talk about New Year's now. Before we talk about this year's resolutions, can we talk about one of mine from this year? At the start of the year, I committed myself to #humhipieamonth, a project where I'd planned to make at least one pie for every month of the year. Why? Masochism. Prior to the project, I was not a very talented pie baker, with most of my pastry crusts turning soggy and losing their shape in the oven. And truth be told, I wasn't even sure I liked pie all that much either. I wanted to teach myself how to become a better pie baker by trying out all the different ways you could make a pie crust, as well as find a flavor of pie I really, truly loved. Crust: Lard and butter from The Four & Twenty Blackbirds Pie Book, made by hand with a pastry blender. Notes: Before this recipe, I'd only ever made all-butter crusts! I loved how much flakier and stable the lard made the pie crust. The pie itself was pretty good, but a little one-dimensional in nature. Crust: All-Butter from The Four & Twenty Blackbirds Pie Book, made by hand with a pastry blender. Blind-baked. Notes: I'd never blind-baked a pie before, so I went with a simple crust design that worked pretty well and kept its shape during the blind-baking process. All-butter crusts are definitely more flavorful than butter-and-lard ones, but finickier to work with (especially when blind baking). Crust: All-Butter from Sweeter Off The Vine, made by hand with no tools. Notes: This was one of my favorite pies from the year; Yossy really is THE PIE QUEEN. Her crust, while delicious, was a little more difficult and messier to put together since you just use your hands and no extra tools. But boy, was this a delicious pie! Flaky crust, tasty fruit filling, and just a stone cold stunner. Crust: Lard and Butter from The Four & Twenty Blackbirds Pie Book, made by hand with a pastry blender. Blind-baked. Notes: After the way my crust turned out the first time I blind-baked a pie (see: Matcha Buttermilk Chess Pie), I got a little cocky and tried to do a huge crimped border for my next blind-baked project. The Pie Gods know when you are cocky. This pie nearly burst into flames, and was not the most photogenic as the crust shrank more than I expected. But that filling was pretty on-point though (do people still say that?). Crust: Lard and Butter from The Four & Twenty Blackbirds Pie Book, made with a food processor. Notes: Using a food processor to make pie crust is a lot easier than manually blending by hand. However, it's easy to overblend the ingredients, which results in significantly less flakey pies. This was also the first time I used cookie cutters to stamp out shapes in the dough, and was pleasantly surprised by how well the whole ordeal worked. I thank the Lard. Crust: Coconut Oil and Butter inspired by various sources (mostly Food52), made by hand with a pastry blender. Notes: Despite its gorgeous appearance, this was probably one of the worst pies of the year. I was frazzled from having to move from San Francisco to New York, and initially posted the incorrect recipe to the dismay of some readers. Still feel bad about that — sorry guys! And while coconut oil helps hold the pie dough shape in the oven and is much easier to work with than all-butter crusts, it also result in a heavier and less-flakey crust. Also pineapple in pies is weird. It turns like, astringent. The peach balances it out, but it would be better if it just wasn't thereun the first place. There, I said it. Crust: All-Butter from The Four & Twenty Blackbirds Pie Book, made by hand with a pastry blender. 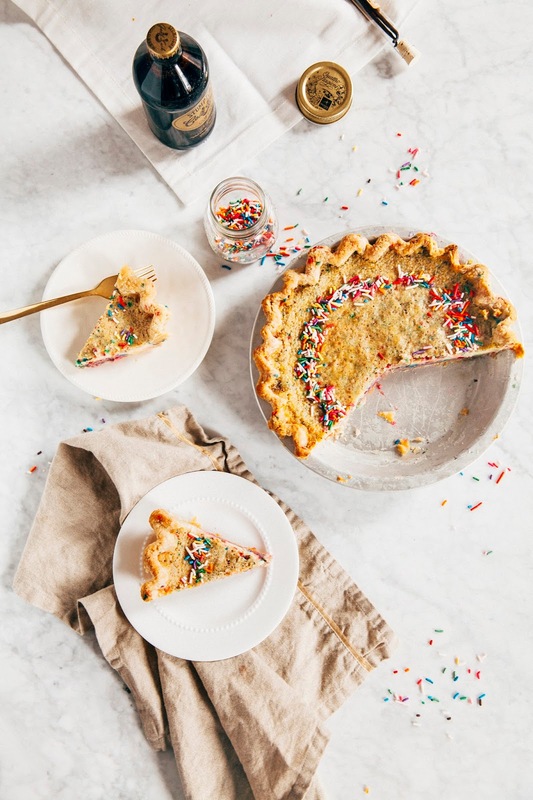 Notes: Pretty classic pie for Forth of July! My default all-butter crust with cherry and blueberry. There wasn't too much contrast in color between the fruit though; I should have used strawberries for greater effect. Oh well. Crust: Shortening with a recipe inspired by Magpie Artisan Pie Boutique, made by hand with a pastry blender. Notes: First time using shortening, which grosses me the EFF out. Although it was easiest to work with, holding its shape and being slower to melt (especially during the city's sweltering summer), I thought it made the pie crust taste bland and turn a weird, greyish color. Crust: Cheddar and Butter with a recipe inspired by Valerie Confections, made by hand with a pastry blender. Notes: A lot of people were weirded out by the cheddar in the pie, but I assure you that cheddar and apple are a classic combination! The cheddar made the pie crust a dream to work with, taking on a texture and pliability similar to a lard and butter crust; the only disadvantage is that cheddar flavor doesn't go with too many fillings besides apple. Crust: Cream Cheese and Butter with a recipe from The Baking Bible, made with a food processor. Notes: If you're looking for a pie that's a good compromise between flavor and workability, cream cheese is the answer! Less gross than lard, and easier to work with than an all-butter crust. The pie crust kept its shape wonderfully after baking, and tasted delicious. One of my favorite pies from the year too. Crust: Speculoos Cookies with a recipe by yours truly, made with a food processor. Notes: The only non-pastry pie crust of the year. Speculoos cookie crumbs. Always delicious. Crust: All Butter and Sprinkles with a recipe adapted from The Four & Twenty Blackbirds Pie Book, made with a food processor. Blind-baked. 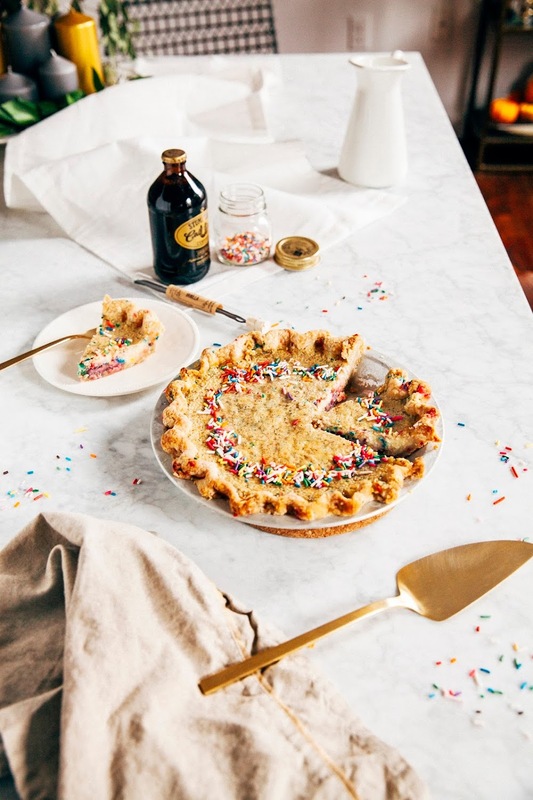 I've turned one of my favorite cakes — funfetti — into a pie. That's right, funfetti pie! The filling is based on buttermilk chess pie custard that I've amped with both vanilla beans AND fake vanilla (a trick from Momofuku Milk Bar) so that it tastes like birthday cake in liquid form. 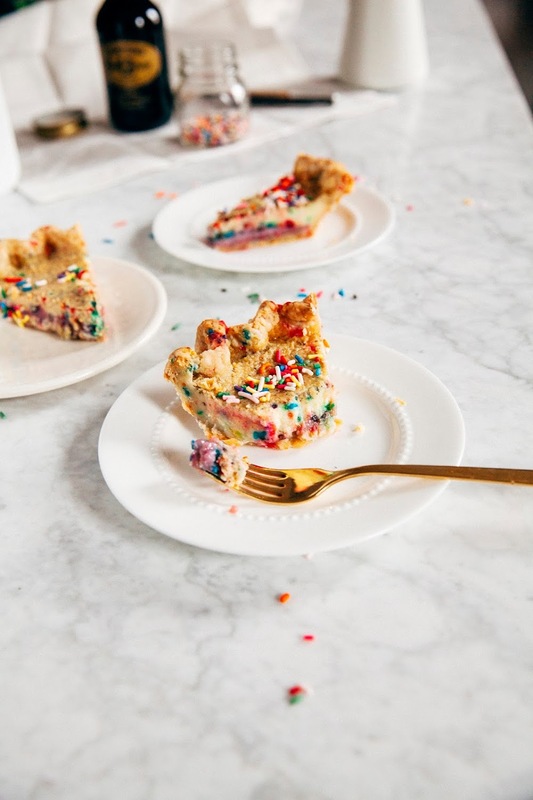 There's sprinkles in both the filling AND the crust, giving you bursts of rainbow with every bite. 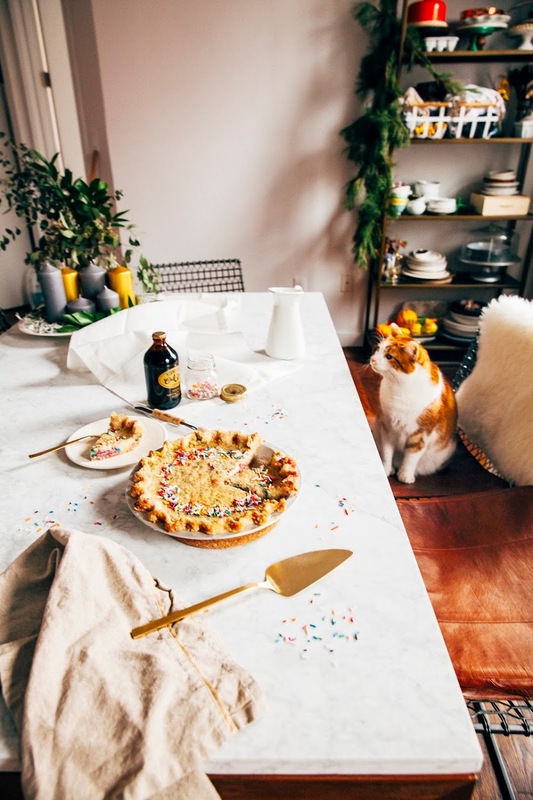 If you close your eyes and sniff the air when the pie is from the oven, it smells exactly like the funfetti birthday cake we all know and love. I had to celebrate the completion of a resolution and end the year with a showstopper, right? Happy New Year, you guys! And thanks for following along with #humhipieamonth. The ingredients are pretty standard except for a couple things: vanilla bean powder and clear imitation vanilla extract. Vanilla bean powder is literally dried vanilla bean seeds in bulk, sparing you from sourcing expensive vanilla bean pods and scraping them out yourself. You can find vanilla bean powder in spice stores, or online. I like buying a bulk bag so I can throw a teaspoon or two into any baked good for extra flavor! As for clear imitation vanilla extract, I'm usually a vanilla extract snob (Nielsen-Massey or bust! ), BUT clear imitation vanilla extract is one of the key ingredients to boxed funfetti mix. It's really what makes the pie taste like the funfetti cake we all know and love. You can find a big bottle of it online or at your local grocery store for only a couple of dollars. Like most custard pies, the pie crust needs to be pre-baked before filling. In general, when baking a pie with a liquid-based filling (like custard or cream), you'll need to "pre-bake" the pie beforehand. Pre-baking, also known as "blind baking", basically gives the crust the additional baking time that it needs to turn into the crispy and flaky pie crust that we all know and love, since custards and creams usually don't need as long to bake. Also, pre-baking helps to prevent the pie crust from getting soggy, which is incredibly important — you don't want a sad, soggy-bottomed pie! Blind baking can be a tricky process though; if you've crimped the crust, it tends to shrink a rather surprising amount (even if you use pie weights to hold down the center of the pie). Be sure to create a large, dramatic crimp to ensure that your pie comes out looking the way you want it to! And for more pie crust tips, check out this recipe for salted honey pie using all my best pie crust tips. Despite the simplicity of the ingredients, the pie filling is actually a little tricky to pull together — it took me a couple times to get it right! The mixture tends to curdle quickly, so it really helps to use a freestanding electric mixer with a whisk attachment (or a handheld electric mixer) to keep it emulsified. Be sure not to skip the step of straining the filling before pouring it into the pie! If you've got a finnicky oven with hot spots, the filling will likely brown faster than it will set. Check on the pie often and use a sheet of aluminum foil to cover the filling and crust to prevent it from browning too quickly! Combine 1/2 cup water, 2 tablespoons apple cider vinegar, and 1/2 cup ice in a large measuring cup or small bowl. Transfer to the refrigerator while you work with the rest of the ingredients. In the bowl of a food processor, combine 1 1/4 cups all-purpose flour, 1 tablespoon rainbow sprinkles, 1 1/2 teaspoons granulated sugar, and 1/2 teaspoon kosher salt. Pulse the ingredients together a few times until well combined. Add 1/2 cup cold unsalted butter pieces and pulse a few seconds at a time until mostly pea-sized pieces of butter remain (a few larger pieces are okay — be careful not to overblend!). Remove the ice water mixture from the refrigerator and sprinkle 2 tablespoons of ice water mixture over the dry ingredients (from the 2nd step). Pulse for a few seconds, until the dry ingredients become wet. Keep repeating this process of sprinkling water and pulsing for a few seconds until the dough comes together and is able to hold together without being wet or sticky; be careful not to process more than 30 seconds. To test, squeeze a small amount together: if it is crumbly, add more ice water, 1 tablespoon at a time, but don't add too much that you end up with a sticky dough. Turn out the dough into a lightly floured countertop and shape the dough into a flat disc. Wrap in plastic and refrigerate for at least 1 hour (but preferably overnight) before rolling out into a pie plate. Once the dough has chilled overnight and has the texture and consistency of saltwater taffy, it's ready to be rolled. Liberally sprinkle a work surface with flour. Unwrap the dough disk and place it on the work surface, sprinkling its top with flour. If the dough is hard, let it rest for a few minutes. If the dough seems too sticky at first, add flour liberally. Use a rolling pin to roll with light pressure, from the center out, moving the pie dough around every quarter to roll it evenly. Roll the the dough to about 13 to 14 inches in diameter and about 1/4 inch thick (place your pie plate upside down over it to check its size). Move the dough into the pie plate by folding it into quarters, then moving it into the plate and unfolding it. When the dough is in the plate, press it firmly into the bottom and sides of the plate. Leave about a 1 1/2-inch overhang over the pie plate's rim and use this overhang to make the crust into the design of your choice (check out my Pinterest board of pies for inspiration!). Use a fork to prick holes all over the bottom and sides of the pie crust, before covering the prepared pie crust loosely with plastic wrap, and chill in the freezer for at least 2 hours, but preferably overnight. When you're ready to blind-bake the pie, center a rack in the oven and preheat to 425 (F). Whisk together 1 large egg white with 1 teaspoon water in a liquid measuring cup and set aside. Remove the pie crust from the freezer and line the bottom and sides with aluminum foil, making sure that the crimped edges are completely covered and there are no gaps between the foil and the crust. Pour the pie weights into the pan over the foil and spread them so the are more concentrated around the edges of the shell versus the center of the crust. Place the pie dish on a baking sheet and bake for 20 minutes, until the crimped edges are set but not browned. Remove the pan and baking sheet from the oven, place on a wire rack, and lift out the foil and pie weights. Let the crust cool for a minute. Use a pastry brush to coat the bottom and sides of the crust with a thin layer of the egg white glaze (from the 3rd step). Return the pan and the baking sheet to the oven's middle rack and continue baking for 3 more minutes. Remove and cool completely before filling. Once the blind-baked pie has cooled to room temperature, it's ready to be filled. Position a rack in the center of the oven and preheat to 325 (F). Place the prebaked pie shell on a rimmed baking sheet. In the bowl of a freestanding electric mixer fitted with a whisk attachment, combine 1 cup granulated sugar, 1 tablespoon all-purpose flour, 3/4 teaspoon vanilla bean powder, and 1/2 teaspoon kosher salt. Whisk the ingredients together until well combined, before pouring in 7 tablespoons unsalted butter and 1 teaspoon clear imitation vanilla extract. With the mixer on medium speed, add 3 large eggs and 1 large egg yolk one at a time, only adding the next egg when the first one is fully incorporated. Once all the eggs have been added, and with the mixer still on medium speed, add 2/3 cup sour cream all at once and continue mixing until well incorporated. Stop the mixer and scrape down the sides of the bowl. Turn the mixer back on medium speed and slowly pour in 1 1/3 cups buttermilk and continue whisking for 1 to 2 minutes, until well combined. Stop the mixer. Working quickly, use a fine-mesh sieve to strain the filling into a medium bowl. It should leave behind any curdled bits from the mixture. 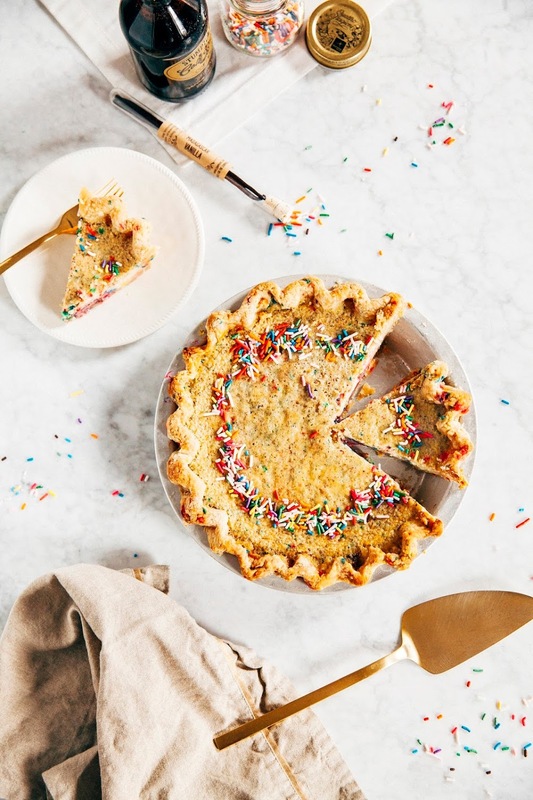 Stir in 1/4 cup rainbow sprinkles, and pour immediately into the blind-baked pie shell. Transfer the baking sheet containing the filled pie to the oven. Bake on the middle rack of the oven for 45 to 55 minutes. Be careful not to overbake or the custard can separate — the filling will continue to cook and set after the pie is removed from the oven. If the pie filling is browning faster than it is setting, loosely cover the top of the pie with a sheet of aluminum foil. The pie is finished when the edges are set and puffed slightly, and the center is no longer liquid but still wobbly. Allow to cool completely on a wire rack, 2 to 3 hours. Garnish with sprinkles and/or whipped cream before serving. Enjoy!